K-Rate interpolation of positive integer input with adjustable 2-point (Cubic) 1D Bezier curve. 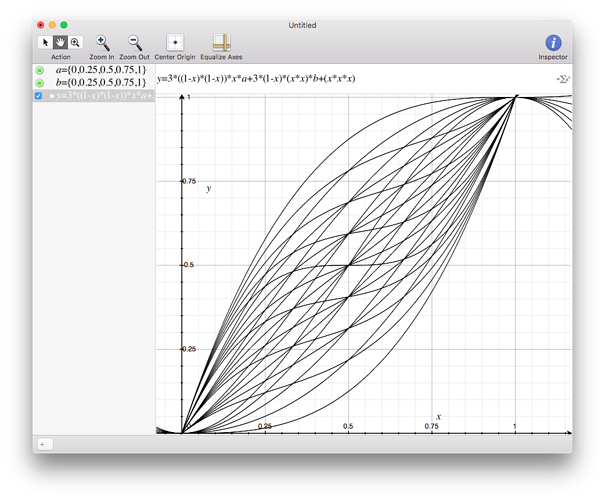 Create logarithmic-like to exponential-like interpolation. Can also create 's' curves. A collection of modules based on an emulation of parts of the Texas Instruments LPC (Linear Predictive Coding) system, famously used in the 'Speak & ...' series of electronic learning aids. Initially based on the Talkie library for Arduino by Peter Knight (hence the name), but I ended up going back to the source of much of his code, the LPC code developed for the MAME arcade/vintage computer virtual machine application. I decided that, rather than simply porting the Arduino code to a single Axoloti object, it would be more fun to break out all the different parts of it into discrete objects. 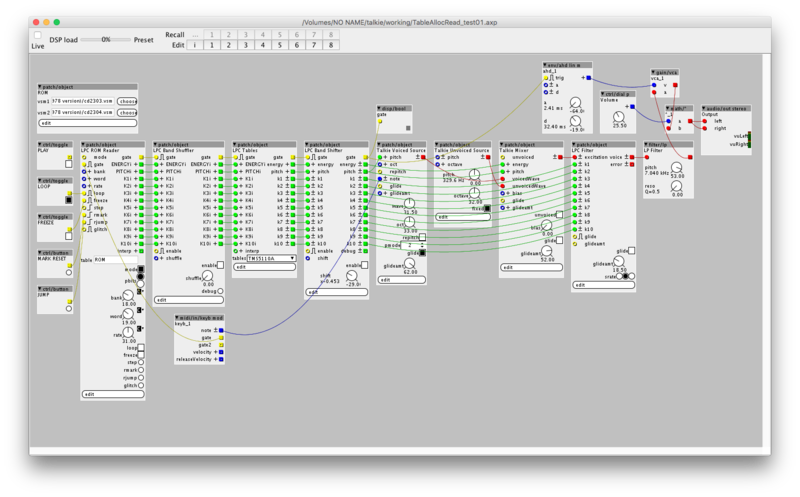 So far, I've created voiced and unvoiced (noise) oscillators, a mixer, a controller object and the 10th-order formant filter. I've also made an object for glitching things up a bit, by reordering the connections to the filter bank bands. 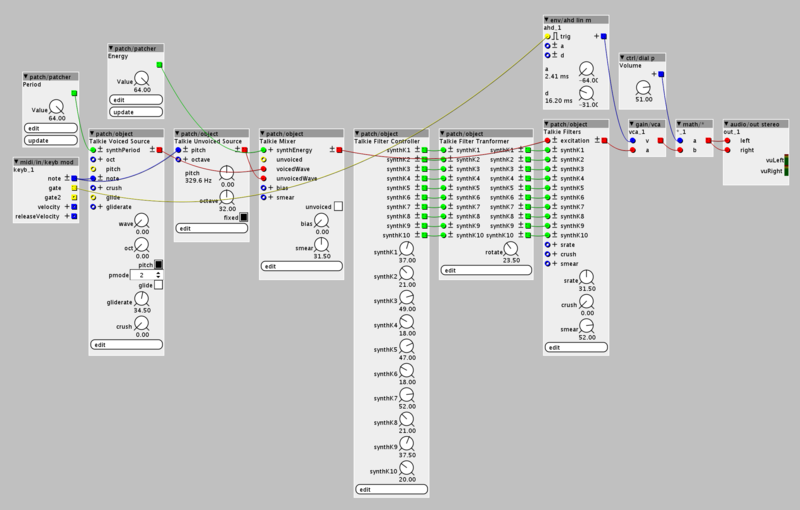 I've added many new options and parameters to the objects that weren't present on the original implementation, but tried to stay largely true to the original sound (i.e. it's still all 8-bit and runs at the original 8kHz). Next to tackle the ROM and main controller emulation. I've got playback working (with apologies to Suzanne Vega)! Next, to implement those classic circuit-bent sounds, but with more control than the real thing. Made some progress on the LPC synth. Now has loading from VSM file(s)! The object-set now numbers 9. It's mostly a compilation of other people's work, but I added quite a few twists of my own. Anyone any ideas on what I should call the objects? I thought just "LPC Toolkit", but that might be a bit boring. tbh, i wouldn't know what LPC toolkit was, without going and searching got it... which your unlikely to do if just browsing the user library. hopefully this will become less of an issue in the future with a better browser... which will probably be first thing on my list after this release - I've been wanting to do this for a while... as Ive been getting the feeling the user library is getting some gems that I often overlook! That's good to hear. I think it will make a huge difference. 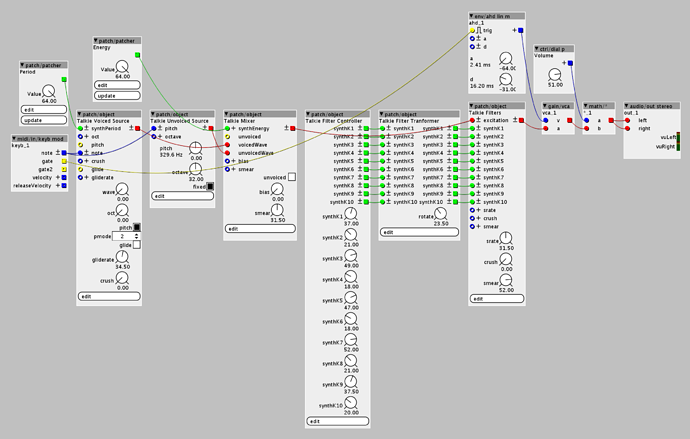 There are lots of great-sounding objects in the user library I've been intending to try out myself. I've just got myself a mini controller keyboard (Arturia MiniLab- works great), so that will help. Wow, thanks... It's something of a labour of love for me, I have to say. I've had a thing for the old S&S toys for some time now (even own both the French and Italian models, though not the German one- that's the Holy Grail). I keep thinking of new things to add, and little tweaks to make. Shouldn't be too long before I feel they're ready to be released in to the wild, though, I think. I had thought it would be cool to control a GinSing/SoundGin chip from the Axoloti. Your implementation is much better! Thank you. There are still a few things I want to add. Interpolation is the first. The Arduino library I originally based the objects on ('Talkie' by Peter Knight) didn't have any inter-frame interpolation, largely because of processor limitations of the Arduino's 8-bit ATMega328 MCU I think. However, the MAME code that that library is based on reproduced the original TI toys' bit-shift based interpolation. My next task is to add that to the Tables object. Good luck. Let us know when,you are happy with it. The lpc objects look awesome. I got all excited, then couldn't find the in the library, now I'm a little sad. Sorry about that, but thanks! They're a bit of a labour of love- love those S&S sounds! I'll get them released as soon as I can. Have to re-style the code squash a few minor bugs, and come up with some help files.